Barnett Kevlar Friction Set; Yamaha FJ1100-1200, XJ1200 and XJR1300. 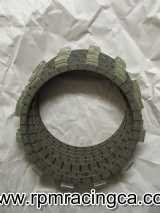 Includes; six (6) wide and two (2) narrow friction discs . Barnett pressure plate replacment springs; Severe Duty Includes six (6) replacement severe duty springs. Severe Duty springs are rated at 82 lbs. Barnett pressure plate replacment springs; standard Includes six (6) replacement standard load springs. Standard springs are rated at 75 lbs. Pressure Plate Bearing; Yamaha FJ1100-1200, XJ1200 and XJR1300. EBC Clutch Spring FJ1100 FJ1200 XJR1200 XJR1300 Direct replacement or use as a secondary spring for improved performance. Neutral Switch Assy; Yamaha FJ1100-1200, XJ1200 and XJR1300 Includes O-ring. Replace the old broken/cracked neutral switch that is causing that pesky leak from the left rear of your engine.